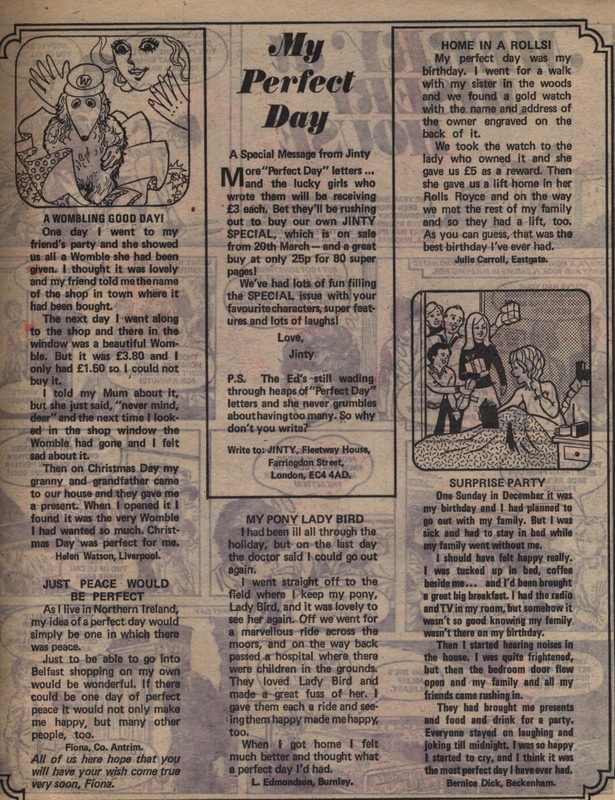 There is a page of reader-produced content: the winning selections in a request made by the Jinty editors for letters on the theme ‘My perfect day’. I reproduce it here particularly because of one letter, ‘Just peace would be perfect’, about living in Northern Ireland – the reader wishes for peace and safety in Belfast. In the intervening years this has indeed come to pass, though there are many fears at present of possible impacts that could affect the Good Friday agreement as and when the UK exits from the EU – and/or the EU Human Rights Convention, the legal framework of which underlies the Good Friday agreement. Merry is planning an escape from Misery House, so as to try to warn the outside world of the cruelties that go on inside its walls. The convicts make a dummy look-a-like of Merry, to hide the fact that she is not returning with the rest from an outdoors stint of fence-mending. Will it work? Kat is still fooling everyone, this time by pretending to sleep-walk to make it look like some missing money was stolen by the innocent Mouse. 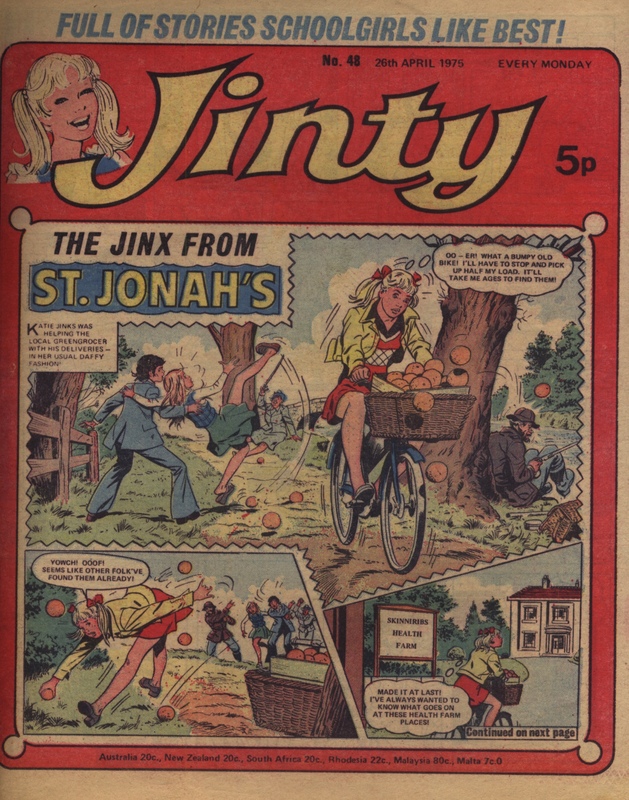 It’s the last episode of “Prisoners of Paradise Island” – school sports mistress Miss Granley was Sally Tuff’s hope for outside rescue, but she seems to be in league with the evil Miss Lush. 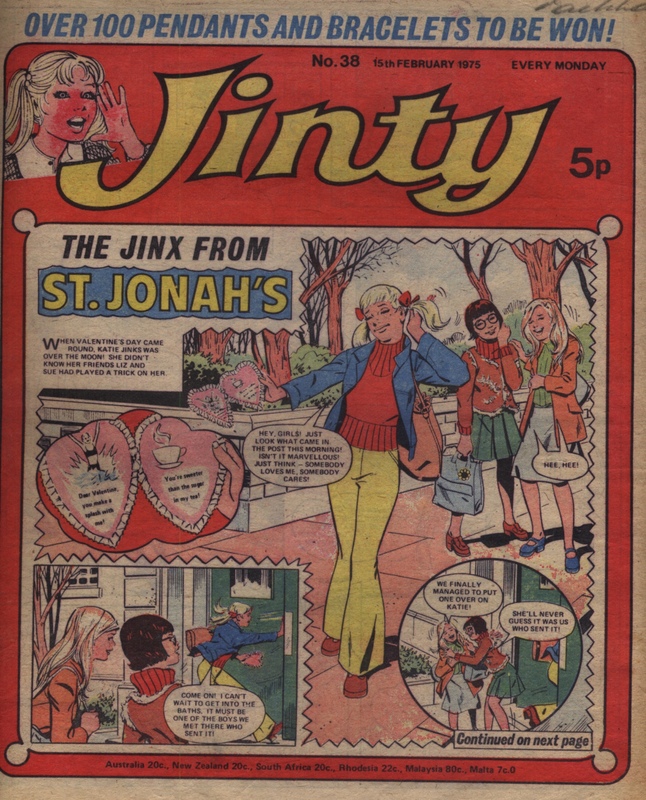 When it is revealed that the teacher is really on their side, Miss Lush pops up and takes Miss Granley hostage – but it all goes wrong for her as reinforcements help the girls to finally fight back against their captors. At the end of the story, we see the hockey team winning the international championship, and we are promised that new dramatic story “Cinderella Smith” (also drawn by Trini Tinturé) starts next week. It’s also the last episode of “Bird-Girl Brenda” – a very sudden ending, as Brenda discovers that going for a walk with her friends – and someone’s dishy cousin Rob – is just as much fun as flying. Just as well, because her flying powers have abruptly deserted her. 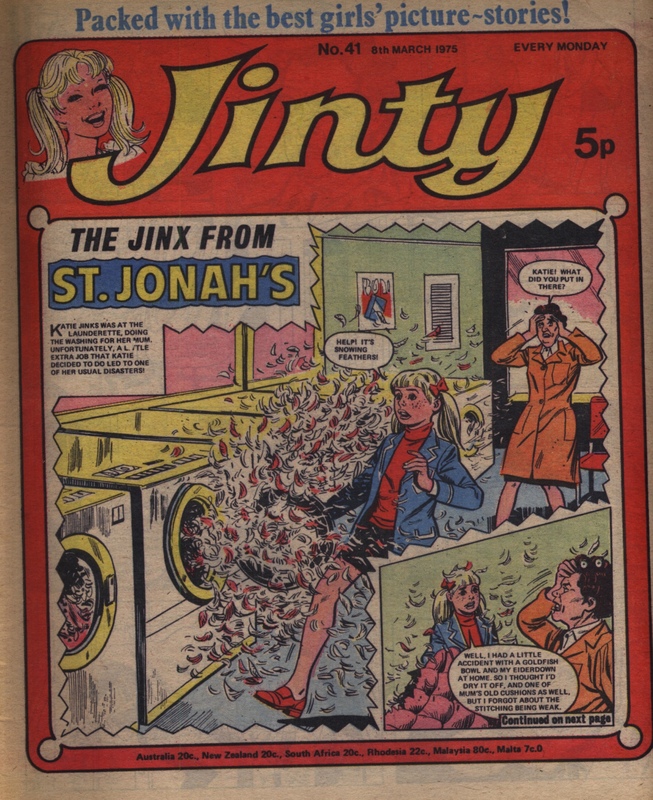 Next week we will get new story “Bet Gets The Bird”, likewise drawn by Phil Gascoine – another lightweight humour strip with no overall story arc. 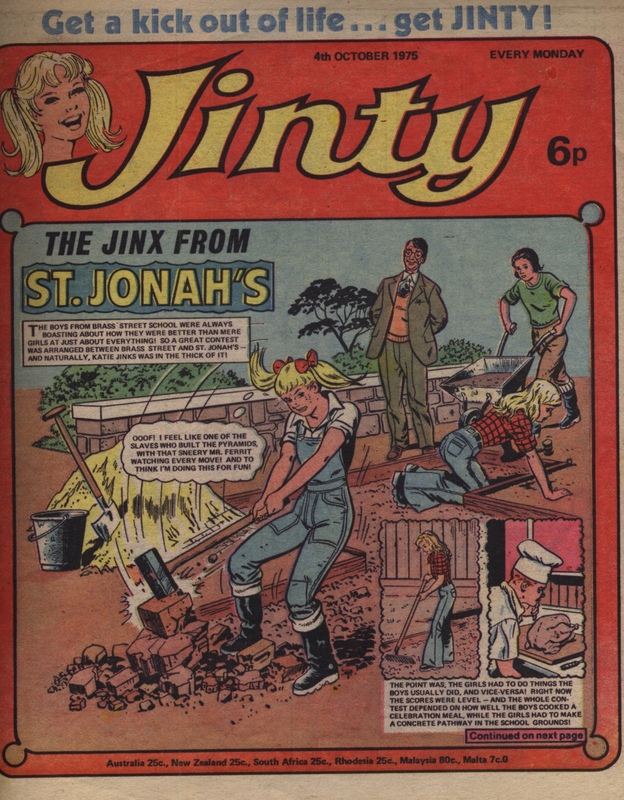 Bet was rather more short-lived than Brenda – perhaps it wasn’t as successful – but for whatever reason that left Gascoine drawing more memorable stories such as “The Green People”, “Golden Dolly, Death Dust!”, and of course the long-running “Fran of the Floods”. It’s early days in “Daddy’s Darling” – protagonist Lee is being looked after so closely by her father that she has no life of her own. Even though she now has to go to the local school, her father is still managing to separate her from others her own age. Mia Blake is still strongly possessed by the spirit in the mirror – not surprisingly it is feeding off the resentment that Mia feels when her sister prevents her from going into a modelling competition.